Since 2004, Belitsoft PHP Development Company has been providing best PHP Web Development services for our clients globally (USA, UK, Israel, Europe, Canada and other countries). We, at Belitsoft, fulfill standard PHP development parameters and offer adaptive PHP consultancy and development services to our clients globally. Would you like to develop a custom app for your startup? Are you looking for an IT provider to rebuild your legacy system (new design, API for mobile app (Android, IOS), transfer existing DB data to a new platform etc.)? Do you need integration with 3d party solutions (CRM/ERP, payment systems, social networks, etc.)? Or something else custom made? Belitsoft Company provides the most experienced resources that will be best-suited for your project needs. We collaborate with start-ups, small businesses and large enterprises to build highly customizable PHP solutions. As a rule, our feature-packed, high-performance, responsive and cross-platform web applications at affordable pricing will give your end-users the best & amazing online experience. Based on the latest technology standards and frameworks, our PHP programming services and PHP-based web solutions will deliver maximum ROI for your business. 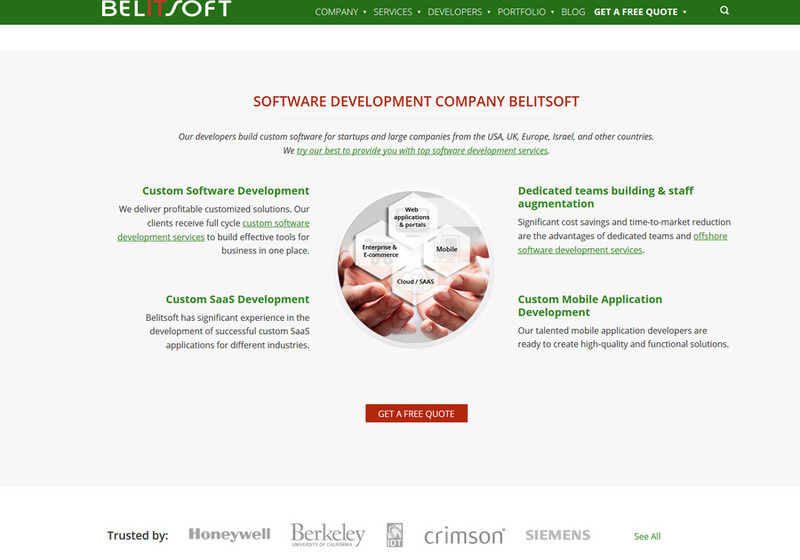 This is a screenshot from our latest homepage redesign of belitsoft.com.